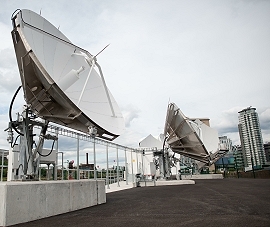 SIS LIVE partners with Babcock to supply uplink services from its teleports. Milton Keynes, UK, April 2016: Leading broadcast connectivity supplier, SIS LIVE, has signed an agreement with the media services arm of Babcock International Group (Babcock) to supply uplink services from their UK teleports. John Bozza, commercial director, SIS LIVE, said: “SIS LIVE provides best in class solutions for many connectivity needs, giving broadcasters direct access to the global satellite market. SIS LIVE’s MediaCityUK teleport is one of the most modern and able teleports in the north of the UK, offering an unprecedented level of 24/7 connectivity over Ku, Ka, C and DBS bands; backed up by SIS LIVE’s teleport at Milton Keynes. Together with NOC operations, the company offers worldwide distribution to a wide range of platforms. David Meynell, managing director, SIS LIVE, said: “Our extensive infrastructure, expertise, and innovative and flexible approach to business meant it made absolute sense for us to work with Babcock on this project. “Recent additions to our management and technical teams have brought the necessary knowledge and experience to allow us to put our comprehensive connectivity network to further use and this is an excellent move for SIS LIVE.